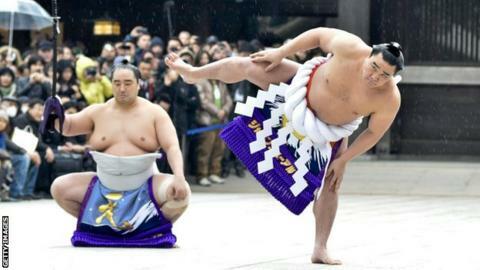 Sumo wrestlers in Japan have been banned from growing "indecent" beards under new rules on grooming and appearance. Some wrestlers in the ancient sport say beards can bring them good luck. But officials have told them beards - along with long nails and tattoos - are no longer allowed. "The sumo ring is sacred and it's important spectators don't see anything unsightly," Japan Sumo Association (JSA) elder Oguruma said. He was speaking to reporters after a meeting of the JSA in Osaka, where the wrestlers' association was informed of the new regulations. "The dohyo ring is sacred. I want the people to feel good when they watch the sport," he added. Media in Japan say sumo officials have called beards "indecent" and want them gone as part of a wider move to clean up the sport's image, following a series of scandals in recent years. "It's an important point so we must absolutely adhere to it," said grand champion Kakuryu.